Okay, so I discovered this recipe on allrecipes.com and was so excited because my entire family LOVES it! The only thing I do differently is add some garlic powder. At first I was a little nervous to have the honey and basil combo because I had never tried it, but they really do well together! 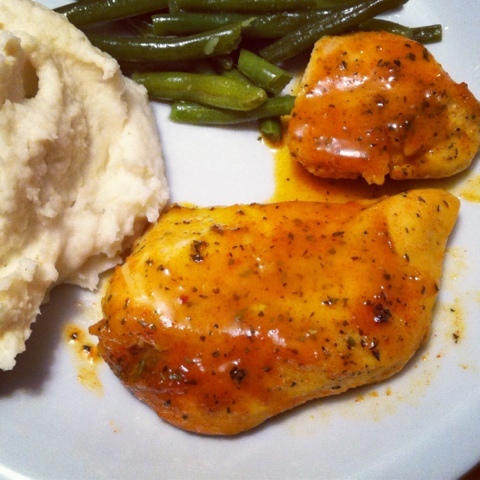 The chicken is really tender and moist and when I serve them with mashed potatoes, I actually like to add the honey mustard over my potatoes. This is great as leftovers too! 2. Next, sprinkle chicken breasts with salt, pepper and garlic powder to taste, and place in a lightly greased 9x13 inch baking dish. 3. In a small bowl, combine the honey, mustard, basil, paprika, and parsley. Mix well. Pour 1/2 of this mixture over the chicken, and brush to cover. 4.Next, bake for 30 minutes, uncovered Turn the chicken pieces over and brush with the remaining 1/2 of the honey mustard mixture. Bake for another 10 to 15 minutes, or until chicken is no longer pink and juices run clear. Let cool 10 minutes before serving. I love to serve this with a side of steamed broccoli or green beans and garlic cheddar mashed potatoes. The green beans are actually pretty amazing in the sauce as well. Sooo delicious! And a kid pleaser!